HomePosts Tagged "Baby Swiss Cheese"
Shisler’s Cheese House Copley is owned by one of our family members. They are located at 1275 S. Cleveland Massillon Rd. Copley, OH 44321 and on the web at www.shislerscheesehouse.com. 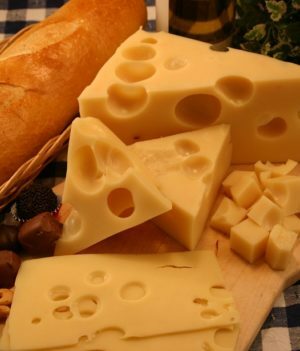 Many steps are altered during the cheese making process to make baby Swiss cheese. To obtain that exquisite, buttery rich flavor, whole milk is used to make the cheese. In order to slow down the bacterial digestion process, water is used to cut the milk. As compared to traditional Swiss cheese, baby Swiss cheese is aged for a shorter period of time to create the more mild flavor.